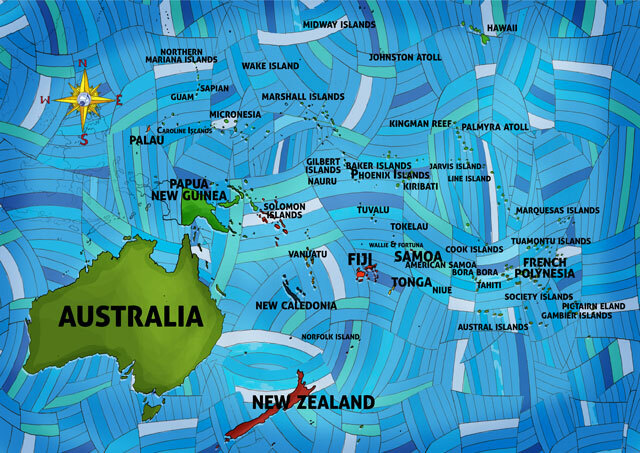 All Around This World’s Pacific islands songs for kids and other songs from all over Oceania and the Pacific islands introduce your family to the region through interactive fun . . .
All Around This World’s Oceania and the Pacific Islands season of songs spirit us away to the distant islands of the Pacific, introducing us en route to Melanesian pigs, Samoan pigeons and drums that lunge forth like a storm. We pine away for home, swim with sharks, terrify our neighbors with little more than a dance and disrespect a treaty never made. We’re going to record much music for the All Around This World Oceania and the Pacific Islands CD project, so much that we won’t be able to fit it all on one flimsy circle of plastic, so we’re planning to split the project in two–Volume 1 to focus on music from Australia, New Zealand, Papua New Guinea and Melanesia and Volume 2 that will introduce you to songs from Micronesia and Polynesia.